The mysterious Gilmour’s Milk strikes again. Might be time to find out a bit about these dairymen … This one is right near the corner of Melville and Reynard. I only managed to dig up a few pieces of information about Gilmour’s Milk on the web. Gilmour’s Dairy Pty Ltd was formed on 23rd of June, 1938. It took over from R.J. Gilmore Pty Ltd and I’m guessing it was just a family consolidation thing. I can’t find any records as to when R.J Gilmour actually started his dairy. From what I can tell Gilmour’s was in operation up until the 1970’s sometime. I just had a peak on google maps and 21 Barrow St is just a regular house. I’m not sure if this is was their actual head office, or if it was demolished to make way for housing, but it doesn’t look like the location of the dairy itself. 114 Derby St is no longer an address, (118 is a double or triple block on GMaps,) but I believe this is where the actual dairy was. The area around 118/112 has a cul de sac named Gilmour Crt running through it, and a quick visit to the area showed that it is dotted with enormous gum trees. I’m just taking an educated guess here but if I find out anything more concrete i’ll update y’all. 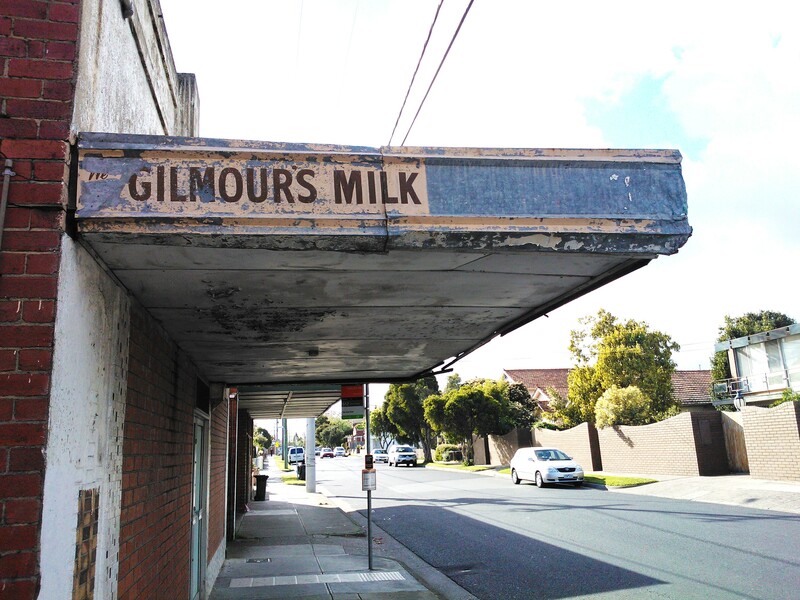 Gilmour’s was obviously the local dairy for the Moreland area which would account for it being so prominent on milk bar facades all around the place. Apparently the milkys would work a six day week. The fella on my my Dad’s route also used to take his horses out to trot of a Saturday, this being his day off. As a general rule Saturday at the track would turn into a boozy Saturday evening at the track, which would then turn into a pretty seedy, crack-o-dawn, Sunday morning milk run. My Dad and his mate Mick would follow the bloke around with his horse and cart helping to deliver the milk, and sometimes would find themselves driving the damn thing and making the milk drops themselves while Old Mate had a bit of kip in the back! Here’s picture of a couple of not-so-drunk men driving around in a Gilmore’s Milk cart, from 1974. Anyway, now back to your regular programming …. Right next door to the Gilmour’s sign was another shop front. It looks like they might have operated separately going by the stepped-up veranda. So many damn shops in this street … I wonder what went down here back in the day? Tags: General Store, Gilmours Milk, Milk Bar. Bookmark the permalink. I live very close to where the Gilmour dairy used to operate at ’21 Barrow St’, so can give you some clarification about it’s former locations of production at ’21 Barrow st’. The 21 Barrow St you searched is in Brunswick, not Coburg. Today, 21 Barrow st Coburg does not exist. This was the location of the head office originally addressed as ’21 Barrow St’ in the old advertisement. I would guess that this address was given as the head office building(s) used to face Barrow st. Furthermore, a bit further south of Barrow st, on the corner of Moore st, the numbers finish at 19. 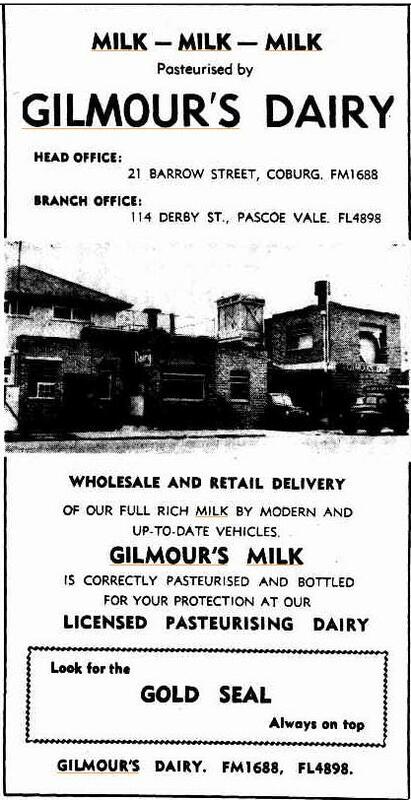 My Mum, who has been in Australia since around 1960, knew about this dairy, so it must have still been in operation at ’21 Barrow St’ for a bit – it would be interesting to go down to the DSE and investigate some old aerial maps to see what sort of buildings once stood on this little corner of Coburg! A bit more info, there was a butcher just across the road from the Gilmour Dairy in Coburg (at 44 Barrow st Coburg – corner of Barrow and Glengyle), the ‘shop’ is still standing, but now used as an extra room for the attached house most likely. Hi i just found this post a bit late but hope this helps…I lived at 39 Campbell St from 1960 to 1969 and the park on the corner of Campbell and Barrow is the former site of the Gilmour’s Dairy. It was a brick building with a retail shop mid way along Barrow St where you could buy milk and cream. The now grassed area between the playground and the laneway included the stables for the horses that used to draw the milk carts.My brother and i used to spend many Saturday afternoons hanging over the horse stalls and come home reeking of horsey smells much to our mothers distaste as she would have to wash our clothes immediately. I remember the nightly clip clop of hooves coming down the street at about 4am and the milky would run from house to house dropping off the rattling bottles of milk and cream and collecting the empty bottles from the day before in a hand held wire crate. The horse would just keep walking and stop every so often for the milky to catch up and re-stock. The butcher shop over the road was run by a Mr King and the floor was covered in sawdust as was the norm back then (1960’s). Further to the left from the butcher was a Milk Bar (now a house) run by a Mrs Heffernan.The building now Montessori Child Care was a Shell’s SSW mini market?.Further along on the North East corner of Moreland and Barrow was another Milk Bar run by an irascible French woman who I still laugh about.I went in with my grandfather in about 1965 and he asked for a packet of “Tally Ho” cigarette papers worth about a halfpenny…she looked him up and down and told him he was the “Last of the Beeg Spendairs”….Unfortunately I saw yesterday (25 10.2017) that it has just been demolished. The Service Station opposite was a Neptune brand outlet (Trident logo) and I used to get glossy colour photos of the Beatles and also plastic Beatles wigs from them on the way home from school at St Margaret Mary’s in Mitchell St Brunswick. (back in those days service stations gave you things!)…. I also recall throwing a Penny Bunger in the Servo forecourt and then being chased up and down streets and lanes until they caught me and gave me something else! The baker had a little van which he would park in the middle of the road and he was a craggy weather beaten old bloke with a leather money pouch over his shoulder. The van only had a half cabin for the driver and there was no provision for a passenger.He would get out and stand in the middle of Campbell St and yell “Maker”..it was easier to say than Baker I guess especially if you had to say it umpteen times a day..the kids would skip behind the van calling “Maker”It was a good area to grow up in,the streets were wide and you could ride a bike or scooter or kick a footy.I even had a skateboard back in 1966 made out of a board and a roller skate.The neighbours watched out for you and weren’t afraid to talk to the kids and vice versa….Innocent times gone for good. Thanks for the great insight into the time, Kieran! I remember Gilmours dairy as they were located near where my uncle lived in Coburg. The dairy in the early 70s was in Barrow St. on the corner of Campbell St. It is now a park called Gilmour Park. I can’t remember when it closed but it would have been in the late 70s and Mrs. Gilmour lived around the corner for many years in The Avenue. The Gilmour head office site at 21 Barrow Street is now a park, fittingly named Gilmour Park (the address is now 79 Campbell Street). I believe it was where milk was bottled but I’m not sure. Plenty of local residents remember when it was operational. There is a “Gilmour Park” on the corner of Campbell and Barrow Streets, Coburg. A neighbour told me that she remembers the ( dairy) animals grazing there. Gilmours also had the property opposite (36-40 Barrow street ) which is now a Montessori Kindergarten.Maybe that was the Dairy’s office back then. Hey there. This business was run by my great great uncle. or my father’s grandfather’s brother. if you want any info I’d be happy to help. its now a caaravan park called morning glory on gilmours rd, moama. miscommunication between me and my dad. it wasnt in moama (which im sure you knew), but it was said relation of mine. sorry! gilmours dairy was on the corner of campbell st and barrow st coburg,the gilmours house faced onto campbell st which was their home.The dairy itself was along barrow st up to a lane way which run off barrow st.The lane way housed the stables and yards for the dairy,The dairy also had a small shop attached to the rear of the house where you could buy milk and ice creams.Milk tankers from model dairy kew and croftbank cranbourne dairies would supply milk in bulk to gilmours. You are correct in everything you say. My father worked at the Barrow Street Dairy for many years until becoming manager of the Derby Street Pascoe Vale branch. Ian & Linda Gilmour owned both dairies and left them to their son Neil to run. My Dad was a milky at Gilmour’s in the 60s and 70s and one of, if not, the last horse drawn milky’s. Pretty sure there was a dairy at Barrow St. Did a few runs with him when I was 8-9. He’d take us out there on the weekends to feed the horses too. Think there was about 10 – 15 horses there, with a spelling paddock up at Pretty Sally. It was a full on dairy were they’d do the processing of the milk and bottling and into cartons later. Only full cream milk and cream on offer back then too. The street was always known a Reynards Road and you can pick old timers who still call it Road. They took the old sign down in the late 50’s I think and replaced it with Street. Old maps show a mix including old MMBW maps showing Reynards Road. Even older maps also mix of road or street and the oldest I saw showed the old farms of what is now Strathmore and Reynards Road. Logically it would be road as it was one of two main roads connecting Pascoe Vale Road and The Sydney Road ( note the “The”), the other being Moreland Road all well before Bell Street I believe. As a rural area Road would more likely be used. Thus it was a busy road and many shops sprang up. People did not travel far so for example small grocer shops abounded in the area but Carter Brothers on the corner of Reynards and Queen was large. There were also cake shops and tea rooms such as at the end of Saunders Street. In fact in Saunders Street there was a tea room and dressmaker shop together at 82 & 84 and you can still see what were the joined shops fronts with houses attached. My grand father built 55 and 63 Saunders Street. Many have been left derelict and that is bad. Others have had a makeover some terrible others ok such as what was the butcher (Palmers ,who went on to build squash courts in Moreland Road, and then Alec Hayes) shop on the corner of Gordon Street. One of the oldest homes in Gordon Street was knocked down for horrible flats despite it being of significance; my uncle owned it. There were two bakeries, Creeds on the corner of Portland Street and they baked the most delicious bread rolls! Around in Melville road was another bakery backing onto Royal Parade where it housed its horses. My sister just recently bumped into an old lady whose parents owned it. Next to the Bug House or Proey was an ice works and wood yard, Prossers I believe. Further toward Coburg past Phillips Street is hazy as it was terra incognito for a young kid.. Oh one last thing, just around the corner of Moreland Road in Haig Avenue a very famous Australian lived. The Chico Roll was made there for many years. My Grandfather Robert John Gilmour started The Dairy in 1927. I lived at Gilmours Dairy for the first 3 or 4 years of my life before moving to 29 The Grove. Thanks for the insight Robert! I used to live down the street from Gilmours dairy in Barrow street in the early 80’s. There was a red brick factory there and it was still producing milk under it’s own brand then. I think they were later bought out by Pura and it closed down not long after. 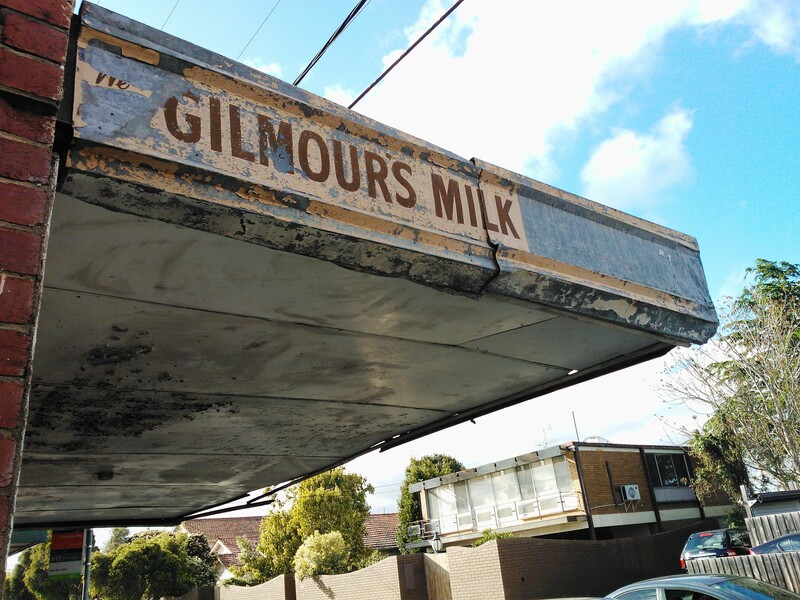 I remember from the addresses I used to read on their milk cartons that Gilmours had another dairy building in North Coburg – I don’t know what happened to that building. The dairy building in Barrow street was demolished and is now a park. Gilmour’s Dairy in Coburg was on the site of what is now Gilmour Park, on the corner of Campbell St and Barrow St. “21 Barrow St Coburg” doesn’t seem to exist anymore, but looks like it was in the park. Quite a few locals remember the dairy. Also, aerial photos from the 1940s on the Melbourne Uni website seem to show the site was previously occupied by housing. The dairy was indeed in Derby St. I lived near there – in Heather Avenue off Sussex St – and as kids we would sneak into the stables to see the magnificent, huge, Clydesdale horses. Being only a little tacker, the horses fair scared the crap out of me up so close, given how big they were! And, yes, I too recall Reynards ROAD. More locally to me, I also remember Warwick STREET, which ran off Derby St near the shops. Latter signage had it changed to Warwick ROAD, but it most certainly didn’t match the traffic levels of Reynards Road to qualify in my books to deemed a “Road”! The site of Gilmore’s dairy in Barrow Street Coburg is now a park land they did also have a site in Derby Street Pascoe Vale my uncle was a Milky for Gilmores in barrow Street he had a horse drawn cart the horse’s name was King. Interesting research. 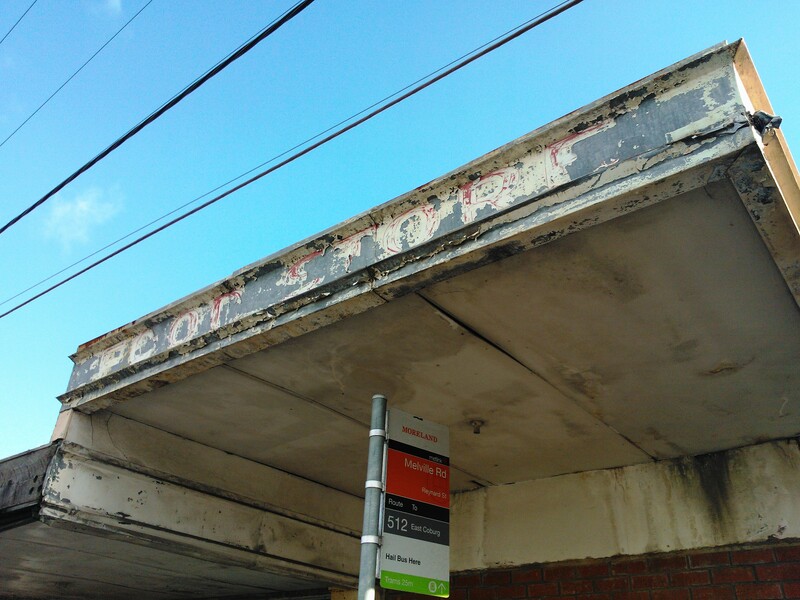 As a Moreland resident and painter of old milk bars, I am interested in the link to the dairies and milk bars. I am trying to get to the bottom of the history of the long closed ‘milk bar’ at 20 Mitchell Street Pascoe Vale South. Yeah, that’s an interesting one … That place is for sale right now! Hey i bought some 50’s books from the op shop and inside found a bill for $2 for 21 pints of milk from gilmour’s dairy. Notes 114 derby as a branch and 21 barrow as head office. Anyway I’d attach a pic but can’t…if you want the bill its yours. Was for someone in queen street…think the account holders name was bissett. Cheers. Yes the Factory was at were the Park is on the corner known as Gilmour Park. If anyone would remember the Milk Bar on holmes st Brunswick. Belonged to my Late father who made the best Milk Shakes with Milk supplied by Gilmours. The drivers name was Keith…a short bloke but would lift the crates of milk like a pocket Hercules…Yes great memories. I recall in the early 70s when before Big Ms, gilmour would one in a while make small 1/4 litre carton chocolate flavoured Milk…they were sensational.